If you’re passionate about gardens, then the Chelsea Flower Show is not to be missed – whether you're lucky enough to visit in person, or watching it from the comfort of your living room. While the hot new trends in materials and landscaping featured at the show – along with the stars in attendance – will make the headlines, it is the abundance of wild, cottage garden-style planting that has captured the hearts of the Period Living magazine team this year. Including several key show gardens, as well as smaller artisan schemes and exhibits in the pavilion, this romantic feel is evident in many of the designs in 2018. Even the more contemporary gardens have embraced this charming look, with country classics or wildflower-style meadows juxtaposed with blunt sculptural elements. The gold medal-winning Welcome to Yorkshire garden, designed by Mark Gregory, is a particular highlight for 2018. 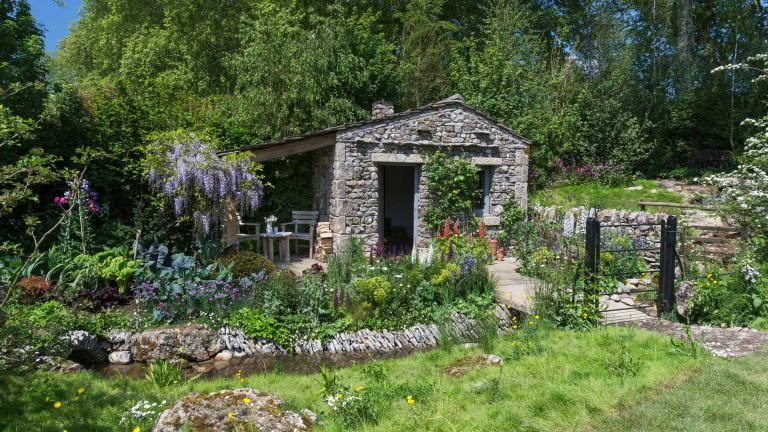 Featuring a rustic converted bothy on the edge of a woodland, with a buttercup meadow, babbling brook, drystone walling and romantic cottage planting, the garden celebrates Yorkshire’s natural materials and traditional crafts. The result is a charming, rural slice of the Yorkshire Dales that is guaranteed to inspire you to dust off your walking boots and escape for a week away. The Mediterranean-inspired M&G garden, designed by Sarah Price and recipient of a gold medal, features terracotta toned walls made of rammed earth. This hard-edged, structural backdrop creates a contemporary contrast to the informal planting scheme. Swathes of wild and wispy planting, including poppies, herbs, blue Catanache caerulea, Cistus, Digitalis isabelliana and single flowered roses, imbue a romantic, uncultivated feel reminiscent of holidays in the sun. Featuring impressive sculptures and art, the David Harber and Savills Garden, created by Nic Howard, has a strong natural theme to its planting, which has been designed to attract insects, bees and butterflies. Inspired by the Winelands of the Western Cape of South Africa, Trailfinders: A South African Wine Estate, designed by Jonathan Snow, features a charming Cape Dutch homestead complete with elegant sash windows. A neat, formal garden at the front of the property has a very English cottage garden feel with its flowering dill, red-pink roses and spires of white foxgloves. This leads through a gate to a vineyard, then beyond to a wild and beautiful fynbos landscape featuring agapanthus, gladioli, kniphofias and pelargoniums among an evergreen, leathery-leaved Mediterranean-type shrubland. Away from the main show garden area, the artisan gardens are full of delight and inspiration. Formality and informality go hand in hand in The Claims Guys: A Very English Garden, designed by Janine Crimmins. It's a celebration of craftsmanship and tradition that draws inspiration from the Arts and Crafts movement. Drystone walling includes a half-dome focal point, which is incredibly difficult to construct. When it comes to planting, box balls, cubes and low hedging contrast with looser planting, including foxgloves and phlox. A perfect traditional English garden. Winner of Best Show Garden at Chelsea Flower Show for 2018, the Morgan Stanley Garden for the NSPCC features a stunning garden room nestled among rich woodland planting and soft textured perennials. The journey through the garden, from wilderness to calm and tranquility, is a metaphor for a child's experience when supported by the NSPCC. Period Living magazine has picked out its favourite plants from the Chelsea Flower Show 2018.